If you are looking for a Rhododendron with impact, then Rhododendron lindleyi is one to consider, if you can find it! 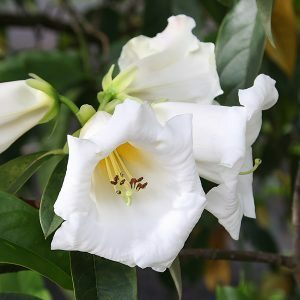 With large pure white flowers with a nice fragrance, it flowers at an early age and although it does not have a compact bushy habit it does provide a different perspective with its open growth habit. Best when grafted, as the root system of Rhododendron lindleyi is not particularly vigorous. It will need to grafted onto a species that falls into the same Maddenia section, so ‘Sino Nuttali’ rootstock is a good choice. Why is this plant so hard to find ? Rhododendron lindleyi does not fit the direction of landscapers who are influenced by the need for mass planting of the same plants and neatness. It might be a great plant, and we think it is, however it has fallen from favour. If you are lucky enough to find this species for sale, and have the space, it is a ‘must have’ addition to the garden of any Rhododendron lover. Choose a frost free position and a humus rich soil. Good drainage is also important. Look for a position in dappled shade where moisture will be available through summer. This is a naturally, ‘Straggly’ plant, pruning will never make it really bushy. We love it, we love the flowers the spicy lemon perfume and the way it refuses to be tamed into neatness.